Build Up: Chelsea v Marseille - Ancelotti, Deschamps and Hoddle! Tonight Chelsea take on Marseille in our second game in the Champions League after beating MSK Zilina the other week. With the game fast approaching plenty of people have had their say before kick off tonight including: Carlo Ancelotti, Didier Deschamps and Glenn Hoddle. Here is some selected reports to get you in the mood for the game. "It's a very good moment, Some people say the squad are young and have no experience. Others say I have all old players. It's a difficult job for me. In my opinion we have a good mix - young players who are improving and others with experience. I don't think a player is old at 30. They have experience enough to play a fantastic game. I have a lot of options, You have to consider that Sturridge and Kakuta are Chelsea players. So is McEachran. We have options and it's normal to have two or three injuries in a season. It's not a problem. On Saturday the problem was not the skill of the players who went on. From the beginning we were not able to change the game and we were not able to change the game with the substitutions either. Experience is a good thing and it is important to have experience as a squad. Obviously the young players need to have experience, too. But these young players are ready to play in the Champions League. I had Deschamps as a player for six months at Juventus and we enjoyed a good relationship. Since then he has done well as a manager, taking Monaco to a Champions League final and Marseille to the French title. "City did a lot of good things against Chelsea at the weekend and though I don't have the same players at my disposal, there are many things we can try to copy. Like City, we will look to close the space, impose ourselves physically and hit them on the counterattack. Chelsea are the favourites to win and, on paper, they are a better side than Marseille. But we are not coming here just to admire their play and cannot settle for staying back. We must look to play our game and create problems." "We can take comfort from the fact Didier Drogba is suspended. But we really need the points after failing in our first match. We know Chelsea are going to be really dangerous. Stamford Bridge is never the best place to go to and it's going to be very difficult for us. If we play conservatively winning will be more difficult but if we play an attacking system then Chelsea's speed could destroy us. During my time with Porto I suffered many defeats against English clubs and I want that run to end. Chelsea have a few injury problems but Carlo Ancelotti has many combinations he can call on. The key for us will be to forget the defeat against the Russians and to think positively. People think it's impossible that we might take three points but we shall be very focused. We all know what victory in London will do for our morale and our chances of progressing further in Europe." “I don’t have a worry for Chelsea in the league. They will win it. They have a great squad and are playing football with freedom. Where I have a concern is in the Champions League. Chelsea have gone so close now and have been going for it for so many years, that I worry if they want it too much. Maybe that desire in them to win the Champions League is burning just a bit too much. It comes from the top, from Roman Abramovich, because that is the trophy he really wants. But it is not just him, it is in the players themselves. They want that trophy above any other and maybe that is a danger. Maybe that makes you a little bit too desperate, clouds your vision. Also, a lot of these players are getting to the stage now where maybe this is their last shot at it – and they know that. You are better off going into a competition knowing you are better than anyone else and knowing you can win it, like Chelsea do with the league. But they have had a few setbacks in Europe so there is not quite the same level of confidence, and maybe a bit of desperation. I’m not sure that is as healthy. So there you have it, the scene is it. Do you agree with what Glenda has to say about Chelsea in the Champions League? Look out shortly for my match preview. For now, if you are going to the game please make sure you check out the advert below!. Make sure you check out Masala Zone before or after the game and experience real indian food. 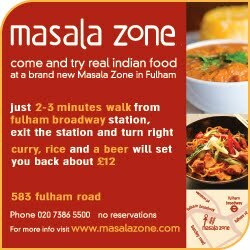 The Masala Zone is opposite Barclays Bank, Fulham Broadway. Please state when you pop in that you have seen their advert on my website "CHELSEADAFT". The more Chelsea fans we can get in there then maybe we can come up with a special deal in the future for Chelsea fans on matchdays!